The event focussed on the role of social media in relation to ASCO 2016 and featured moderated discussion between our very own Dr Paul Tunnah, who chaired the webinar, and leading experts from both the clinical and digital arena. Which channels were the most popular? What types of individual / organisation took part in the social media conversation? What topics were of particular interest? How had the conversation evolved from last year? How are the onsite activities linking to social media conversation? 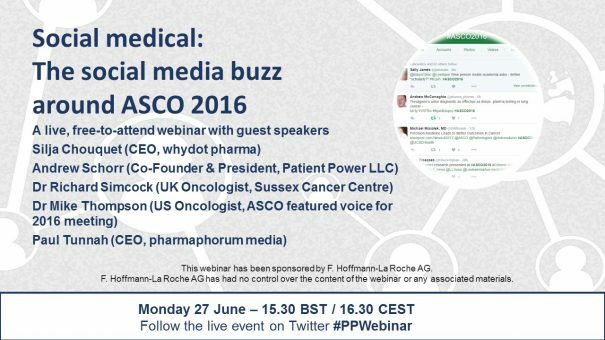 What are the opportunities for social media engagement around ASCO next year / how will it likely evolve? The live webinar took place on Monday 27 June at 15.30 BST / 10.30 EDT. To view this webinar on demand, please click here or on the button above/below. Michael A. Thompson, MD, PhD is a hematologist/oncologist and cancer researcher at Aurora Health Care (AHC) and the Aurora Research Institute (ARI). He received his Bachelor of Science degree in Molecular Biology from the University of Wisconsin – Madison, his Medical Degree from Mayo Medical School, Rochester, MN, and PhD in Molecular Pharmacology and Experimental Therapeutics from the Mayo Graduate School. He completed his Internal Medicine Residency at the Mayo Clinic College of Medicine. He obtained his Hematology/Oncology Fellowship at the University of Texas M. D. Anderson Cancer Center in Houston, TX. He is board certified in Internal Medicine, Medical Oncology, and Hematology. Dr. Thompson received the American Society of Clinical Oncology (ASCO) Young Investigator Award in 2006 and the Achievement in Clinical Investigation Award through the M. D. Anderson Cancer Center Hematology-Oncology Fellowship Program in 2007. As a fellow he trained in the American Society of Hematology Clinical Research Training Institute (ASH CRTI). He served on the ASCO Integrated Media/Technology/Education Committee and went through the ASCO Leadership Development Program. He recently rotated off a three year membership on the ASCO Cancer Research Committee. Dr. Thompson is Chair (2016-2017) of the ASCO Research Community Forum. He is Chair (2016-2017) of the ASCO Education Committee and is helping plan the ASCO 2017 Annual Meeting. He is active on social media (Twitter: @mtmdphd) with multiple publications and national/international presentations on the topic of the use of social media in hematology and oncology. He is a current member of the ASCO Social Media Working Group. Dr. Thompson has developed the follow social media accounts or hashtags: @Aurora_Cancer; #CardioOnc (Cardio-oncology); #CCDR (Cancer Care Delivery Research); @EAOnc #EAOnc (ECOG-ACRIN); @LungCaNetwork (CRAB CTC); #mmsm (multiple myeloma social media); #wmsm (Waldenstrom’s macroglobulinemia); and #NCORP. He blogs at ASCO Connection and Oncology Times. Dr Richard Simcock has been a Consultant Clinical Oncologist at the Sussex Cancer Centre since 2004 where he treats patients with breast and head & neck cancers. He previously worked at the Sydney Cancer Centre, Australia having completed specialist training in oncology in London and the South East. Richard is particularly interested in the effects of cancer treatment on patients and has worked nationally and locally with Macmillan and the National Cancer Survivorship Initiative to improve care planning and after care. In 2016 he became Chair of the National Expert Reference Group on Cancer in the Older Person. Together with colleagues he is an active member of the radiationnation.com community – an online platform for collaboration within radiation oncology and contributes regularly to the #radonc international journal clubs on Twitter. In 2016 he edited a special edition of ‘Clinical Oncology’ on Head and Neck Cancer. He is also a Trustee of Cancervive, a Sussex-based charity providing peer support to the families and friends of those with cancer and Medical Adviser to ‘Mummy’s Star,’ a charity supporting those women diagnosed with cancer in pregnancy. Silja is a social media strategist and insights lead. She brings deep understanding of disease and therapy area trends through her work with online influencers and patient advocates. By recognizing early the power of social media, Silja Chouquet has spent the last 10 years researching patient needs by analyzing their conversations in online communities, Twitter and Facebook. She helps organizations embrace patient empowerment. Currently, she consults for companies via her own agency, whydot, and is also an entrepeneur at Merakoi, a social media research start-up, which generates insights by engaging key online influencers directly and enriching traditional research approaches with their expertise and knowledge. Silja is a former strategy consultant and has worked in leadership positions at two global pharmaceutical companies. Andrew is a medical journalist and patient advocate living with two blood cancers: chronic lymphocytic leukemia and myelofibrosis. For CLL, participation in a phase II clinical trial led to a remission that has continued to 16 years. For myelofibrosis, a oncogene inhibitor oral medicine has provided significant control. In partnership with bis wife, Esther, Andrew has been a pioneer in online and video patient education for chronic illnesses and cancer since 1984 and, since 2005, as co-founder of Patient Power, a leading digital channel for thousands of cancer patients in the U.S. and Europe. He is author of the acclaimed book The Web-Savvy Patient. Patient Power, through it’s patientpower.info, patientpower.eu and partner websites like oncologytube.comand social media reaches an estimated 100,000 cancer patients per month. In-person educational events at major medical centers on specific cancers and from medical conferences in the US and Europe are broadcast live and content reaches several thousand patients per event. Dr Paul Tunnah founded pharmaphorum media in 2009 which has rapidly evolved and developed its offerings to drive better communication, connection and collaboration between the pharmaceutical industry and other stakeholders. Today the groups spans expertise in publishing and consulting around content-driven customer engagement. The offerings are underpinned by the common strengths of extensive global networks, a firm finger on the pulse of changing market dynamics, and deep expertise in creating engaging, relative media. Prior to this, Dr Tunnah obtained a BA in Biochemistry and DPhil in Biological Sciences from Oxford University, before working in commercial consulting for Datamonitor, IMS Health and SmartAnalyst. This webinar was sponsored by F. Hoffmann-La Roche AG. F. Hoffmann-La Roche AG has had no control over the content of the webinar or any associated materials.